United States residents don’t need a passport to enter Puerto Rico. For that reason alone, I recommend a vacation to this tropical island. Access is convenient, with direct flights from many East Coast airports. What’s more, the lush island is chock-full of interesting colonial history and white-sand beaches, as well as a few “don’t miss” outdoor activities that are unusual and fun. A fascinating phenomenon courtesy of Mother Nature, dinoflagellates are microscopic plankton that live in water and emit light when shaken and stirred. So, at night, when you kayak through bays where the tiny creatures live, your moving paddles will seemingly “light up” to create an eerie glow. There are three areas in Puerto Rock where you can kayak in in this type of ecosystem: Mosquito Bay, off Vieques Island; Bahia Monsio Jose and Bahia la Parguera in La Parguera (the southwest coast of Puerto Rico); and Laguna Grande in Farjardo (the northeast corner). On my most recent visit, I explored Laguna Grande. The trip began with the thrill of kayaking through narrow tunnels of mangroves just before sunset. Then we paddled into a large lagoon as the sky turned an inky blue. Finally, we moved our paddles to agitate the dinoflagellates, and then kept an eye out for fish swimming along, leaving a trail of neon behind them. Filled with fern-lined trails, tumbling waterfalls, and a myriad of tweeting birds and creepy-crawly insects (they’re cool, not scary! ), a visit to El Yunque is a nifty way to get up close and personal with a Caribbean rainforest. A network of hiking trails is well marked and mostly moderate; some are even paved in asphalt. It’s an easy walk to La Coca Falls, a popular photo op, and then onto La Mina Falls, where you can hop in the refreshing water underneath 35-foot cascades to cool off. If you’re in San Juan on a Sunday afternoon, you must visit the expansive lawn of grass on the approach to Castillo San Felipe del Morro (or “El Morro” or “Morro Castle”), a 16th-century fortress that was built by conquering Spaniards to protect the valuable port from invaders. 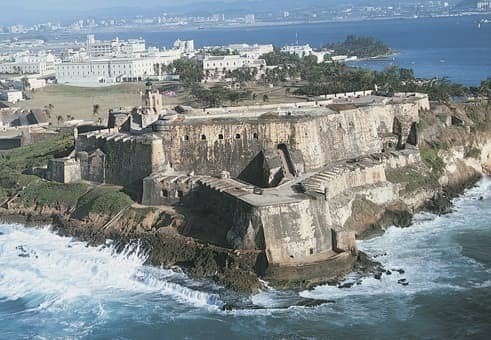 Today visitors can tour the fortress (as well as neighboring Castillo San Cristobal); this is a worthy endeavor, since the fortification’s ridiculously thick walls, massive cannons, and towering lighthouse are quite grand. Viewfinder Tip: If you like flying kites, the wind in Puerto Rico is especially strong between February and April. I think it’s equally fun to enjoy the scene outside the walls: Families, schoolchildren, and toddlers flying dozens of kites in the island trade winds. You’ll see most locals gather on Sundays, but kite-flying takes place anytime the breeze blows. You can join in the fun, too: Purchase your own kite from nearby vendors (or in shops in Old San Juan), then pass it along to a local child before you hop on a plane to return home. What are your favorite outdoor adventures in the Caribbean?